Blog Quick Quotes: Road Trip Mini with Donna! Road Trip Mini with Donna! Hello fellow scrappers, Donna here today to host the blog for you! Today I would like to share a Road Trip mini album I made using Quick Quotes and Want2scrap products. Right below is the cover, I decided to use black accents and the charms were on my key chain at one, but became to bulky. On this page I used Baggage Claim and Sheer Joy, which will be coming soon to Quick Quotes. The first page of album has the route we took. I took the map from the internet and colored in the roads we took. With Want2Scrap Rhinestones - Turquoise I marked our starting and stopping points. I also used a chipboard piece from the Be Bold collection. This was the Bed and Breakfast we stayed it, again using the Rhinestones and this time I used Sheer Joy Diecut chipboard. This page I made a pocket to hold various other pictures and added some chipboard and paper tags. 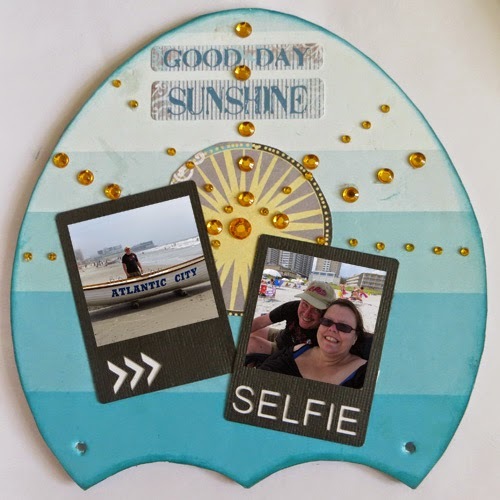 Using Sheer Joy paper and I made a sun beaming out with the Want2Scrap Amber Rhinestones . Also I wanted to mention that every page with inked with Baja Blue Powderpuff Ink from Quick Quotes. This ink has such a gorgeous turquoise, I love it! Here again, I used the Sheer Joy paper along with chipboard to create this page of some pretty views we had on a morning walk along the beach. Of course every vacation is about good dining, and this vacation was no exception. The final page I made another pocket to hold receipts and misc. ephemera we collected along the way. I used a piece of vellum to create the pocket, glued and inked along the edges, added some bling and some Quick Quotes quotes. Easy peasy! Thank you for stopping by and come back tomorrow for some more inspiration. Love the album shape and how you incorporated the road map and great photos. Fabulous mini! I think my favorite page is the one with the rhinestone sunshine!